Most homeowners understand that renovating a home is an enormous undertaking, involving months of careful planning, communication, compromise, and significant financial cost. 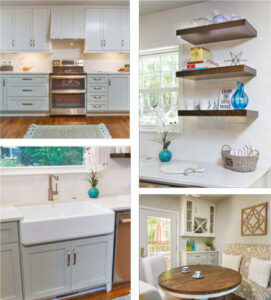 Renovating a kitchen means all of that and more. With its many functions and components, today’s kitchens are so much more than simply a place to prepare a meal; they are often the heart of the home— the central place for meal preparation, family dining, homework, and entertaining. Embarking on the renovation of a room that is so integral to family life is not to be done lightly. 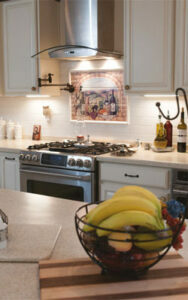 Kitchen renovations can take two to four months or more to complete, depending on the complexity of the job. But as three fortunate Roanoke Valley families discovered, sometimes the wait is oh, so worthwhile. Linda Horwatt makes the trip from Southwestern Virginia to Houston, Texas quite often to help her daughter Susan Murphy with her four young children—a gift of her time that Susan describes as “priceless.” So perhaps its not surprising that Susan Murphy wanted to give something back to her mother. After careful thought, she felt that what Linda would most enjoy was a new kitchen for her 1970s ranch home in Garden City. “My mother still lives in the home I grew up in,” Susan explains. “She raised my brothers and me in that home, and now that we are all grown and moved, it just seemed like a bright new kitchen was something she deserved.” Working together, Susan and Linda planned out a list of things they felt would be necessary upgrades for the space, with an eye to redesigning the kitchen to be more efficient, better suited to Linda’s needs, and more attractive. Susan and Linda saw an ad for Circle Design Studio, did some online research, and called John and Theresa Dorlini, the husband and wife owners of the design and build firm. The Dorlinis were perfect for the job—with combined backgrounds in architecture, interior design, and a Class A contractor’s license (the highest level of licensure), Circle Design had the ability to take on a detailed renovation project from the design phase through completion. The project was challenging because of the tight turnaround time—Susan wanted the renovation to take place while her mother was visiting them in Texas—and the scope of what Susan and Linda envisioned. “We were contacted by Susan,” John Dorlini recalls, “And were blown away that she wanted to do this project as a gift for her mother. We have young kids ourselves, and were both touched and excited to take on this job.” Dorlini credits the advanced design software they use, which allows them to show plans in 3D, for helping with the success of the undertaking. “It gives us the chance to see the entire project before it begins,” he explains, “And helps the clients to envision what we’ve designed.” It can also help to cut down the design time, since clients can see everything about the room, even how their own furniture will look. Frank and Sally Corbin purchased their home on the Blackwater River in Glade Hill three years ago. The couple, originally from Maryland, were looking for a home for their retirement years, and when their real estate agent showed them the house, on five and a half acres with frontage on the river, they knew they’d found just the place. The home was a perfect size, and the land had a gentle slope down to the river, but the kitchen needed some work. “We purchased the home knowing we needed to do something about the kitchen,” Sally laughs. “I mean there were only four cabinets!” Storage was definitely an issue, but Sally explains that the layout was also cramped, especially the area around the oven. “Frank and I were always bumping into each other,” she recalls. “I’m the cook, but he’s the cleaner, and it was hard to work around each other.” The couple planned to live in the home during renovation, so they wanted to be especially careful about minimizing the time they were without a kitchen. After researching, Frank and Sally decided to work with Tommy Rakes at The Cabinet Gallery at Smith Mountain Lake. Rakes put his forty years in the building industry to work for the Corbins and their challenging kitchen. “We discussed changing the areas where the traffic patterns weren’t good,” he says. “I’ve learned over the years that you have got to listen to the customer carefully in order to balance their goals with my own advice to help them navigate the planning process.” Sally wanted an easily-accessible double oven and more storage, and Rakes showed the couple how they could get that, plus a better layout around the sink and refrigerator. 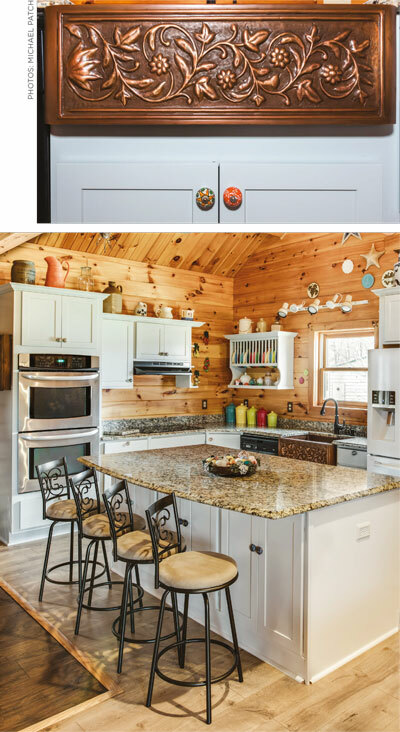 It took four versions to get the plans just right, and then the Corbins moved on to the task of choosing colors for their cabinets and countertops. They discussed timeframes, and Rakes assured the couple that once the planning was done, they would be able to use their new kitchen in five weeks’ time. 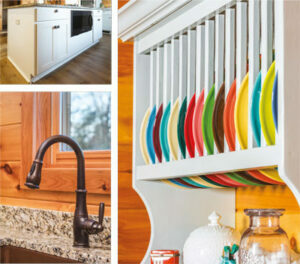 The Pouloses discussed these goals with Terri Langford, owner and designer at Cabinetry With TLC in Roanoke. Langford was intrigued by the idea of reinventing a family kitchen and felt a sense of rapport with Deno and Tina. “They were a lot of fun to work with,” she recalls. “They knew what they wanted from their space, but were also open to suggestions.” They decided to open up the dining room and existing breakfast area to the kitchen to achieve the open plan more popular in contemporary kitchens, and placed a seven-foot island at the center of the space, giving Deno and Tina lots of room for prepping and cooking. Next, appliances, semi-custom cabinets and solid surface countertops were ordered. The family was not living in the home at the time of the remodel, which made some things easier. Langford and her contractor had constant access to the site, allowing for a quick turnaround, and the Poulos family wasn’t trying to live in a home during major construction. “We always say that there is going to be some inconvenience when you are remodeling, “ says Langford, “But our goal is to minimize the inconvenience as much as possible.” To this end, she pre-scheduled all the countertop templates, so that everything would be ready to go when the new cabinets arrived. Through it all, Langford was in constant communication with the Pouloses. “Communication is huge,” she explains, “And keeping that line open makes all the difference.” For example, when Tina mentioned her desire to incorporate some nostalgic items from the old kitchen into the new one, Langford found a way to repurpose Tina’s favorite keepsake—a French door that separated the old kitchen from the dining room—as a barn door for the pantry. They were also able to incorporate the whimsical glass cabinet knobs that are filled with navy beans, kernel corn, and various herbs, that belonged to Deno’s brother. 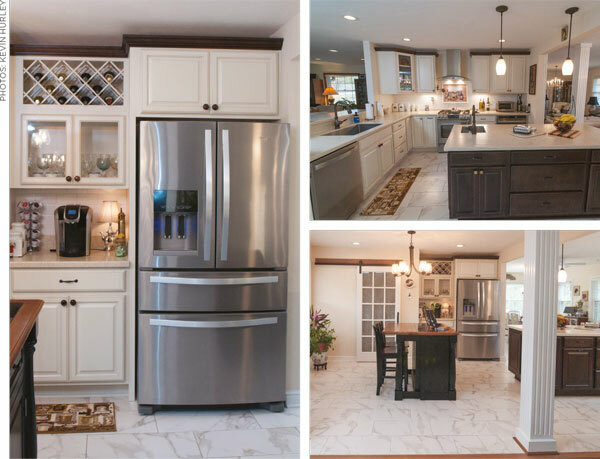 These stories show that every successful kitchen renovation involves a combination of realistic goals, research, communication, flexibility, and patience on the part of the homeowner and their design and build team. Whether you’re the kind of person who finds the design process exciting and fun, or somewhat daunting, it’s the time and effort spent at this stage that makes the subsequent renovation go smoothly, and ensures that the finished product lives up to your expectations. It is possible to give this all-important room of your home the makeover it deserves and at the same time, get the space that you and your family will enjoy for years to come.